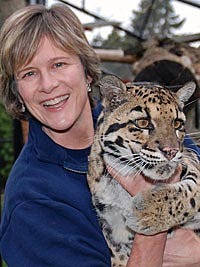 I am a Senior Staff Biologist at Point Defiance Zoo & Aquarium and Coordinator of the Clouded Leopard Project. I conduct live animal education programs at the Zoo and care for the Zoo's clouded leopards, including hand-rearing our adults Raja and Josie and their cubs. From the time I started working with clouded leopards in 1998, I have been amazed by their beauty and incredible adaptations. I was also concerned that we knew so little about clouded leopards and wanted to do my part to help learn about them and work towards preserving them in the wild. I've been working with wild cats in zoos since I began my career in 1983. I studied Zoology at University of California at Davis and held many volunteer positions working with animals before getting my first zoo job. As my interests turned toward developing conservation education programs, I returned to school to receive a Masters degree in Education from the University of Washington. My work with the Clouded Leopard Project has enabled me to become involved in conservation efforts for wild clouded leopards. I have been fortunate enough to travel to Thailand several times to visit clouded leopard habitat and meet with teachers and students. During one visit I helped organize a clouded leopard festival at the Khao Kheo Open Zoo. It was a great feeling to introduce Thai kids to one of their native animals that most of them had never even heard of! To work with wild cats at a zoo you need to have a four-year degree in one of the natural sciences. It is very helpful to have as much volunteer experience as possible to learn what it is really like working with animals! Your first zoo job might not be with cats, but it is important to get your foot in the door, be a hard and dedicated worker, and continue to learn as much as you can. I do. I'm optimistic that we are taking action soon enough to protect them - while there are still decent numbers remaining. However, we still know almost nothing about the natural history and distribution of the species. Until we learn more, it will be impossible to develop a comprehensive plan for their protection. We know they face many threats and we need to know how best to address them. Start by learning as much as you can and spreading the word about this amazing cat! Tell your friends and classmates about them and the work of the Clouded Leopard Project. Saving a species is expensive work so any fundraising you can do to benefit clouded leopards will make a difference. Write us a letter or poem or send us a picture sharing how you feel about clouded leopards! Caring is the key to conservation.